Did you watch the latest Friday release in the nearest Cinema hall? If, No, not yet, is your answer then go and watch it, you will fall in love with heroines’ designer clothes and shoes. This is a small extract of the conversation I heard while standing in a queue for the tickets of a latest Friday release. Cricket and cinema are the two Cs associated with the Indian masses, that spell revenue. Bollywood has a larger appeal to the Indian masses as films are believed to be in the blood of most Indians. People laugh and cry with the actors in a movie. They identify with the film stars and try to imitate them in their day-to-day activities. They wish to wear, and buy merchandise used by the stars in the movies. This has given birth to the concept of film merchandising. Moreover, the emergence of organised retail film merchandising has become a huge revenue generator. The bigger the hit, the more popular will be the sale of its merchandise. 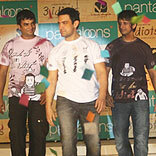 A recent example of film-based merchandising is the Aamir Khan starrer 3 idiots’ association with Pantaloons. A fashion show was organised where Aamir khan walked the ramp with co-stars Madhavan and Sharman and showcased the range of 3 Idiots T-shirts by Pantaloons. Another movie, Wake Up Sid tied-up with Provogue and launched a stylish range of Wake Up Sid T-Shirt Collection. The collection was inspired by the clothes that Ranbir Kapoor wore in the film. To reach out to the youth, Love Aaj Kal formed an association with Café Coffee Day, pan-India and tie-ups were also formed with Bajaj Allianz, Shopper’s Stop and Gitanjali for the movie’s film merchandising. Similarly the merchandise for Aladin, a fantasy film had autographed sweaters and shirts of Aladin. The film makers also launched special Aladin flavoured ice-creams with Baskin Robbins; formed a tie-up with Disney, and Hungama and launched special merchandising for children, like Aladin character tattoos, T-shirts and also tied-up with Godrej for the biggest ever brand tie-up in the industry. Considering the current scenario, almost every new film release is accompanied by the launch of its merchandise. It is not only leading to revenue generation but it is also acting as great marketing tool. Promotion: Film merchandising leads to the promotion of the film from the unconventional outlets. House hold name: Film-based merchandise gives huge popularity to the film and it becomes a house-hold name. Revenue: If the film and the merchandise are good then it can be an additional source of income for the producer. Evergreen: Films get immortalised through its products. Licensing the merchandise: Since the deals are time-bound the producer can earn additional revenue by selling/licensing the merchandise again once the earlier contract is over. Quality concern: If the quality of the merchandise is bad, this could affect the perception of the movie. Unsold stock: In case the movie does not do well the merchandise might get stuck with unsold stock. No doubt, the concept of film merchandising has a huge potential but there is a word of caution before you opt for it. Be selective: The selection of the merchandise to be launched should be done very carefully. No compromise on quality: Agreed that people would love to buy film-based merchandise but they can not be fooled with bad quality products. So the quality of the merchandise has to be good. Cost of the merchandise: Prices should be right and appropriate depending upon the target audience of film. Need based merchandise to be created: Every movie is not merchandise-friendly and the film should be carefully selected for merchandising. The film-based merchandise should have a mass appeal and the products to be created can be inspired by the film dialogues, costumes, songs, posters even jewellery which become big hits depending on the success of the film. The future appears to be quite bright for film merchandising in India. Very soon it will be a legitimate revenue source for films that have the potential for merchandise, just like home video, music and digital rights are a revenue stream for film producers, the same will apply to film merchandise.